ChargeWheel’s Energy Trailers, as the mobile EV charging solutions are called, combine solar panels with a 550 kWh battery system to set up a mobile, but competent charging system. Charging capacities of the trailers are still somewhat vague, but the manufacturer claims that up to four EVs can charge simultaneously at DC fast charging speeds. The plan is to deploy up to 100 of these trailers by the end of the year, when another round of funding is expected to launch. CEO of ChargeWheel, Huzaifa Muhammad, described their appeal as such: “ChargeWheel’s offering addresses the sustainability and efficiency shortcomings in the micro-mobility industry by providing a cleaner and more convenient way to charge electric modes of transportation in cities.” While the independence from the grid and capacity to generate their own electricity may prove vital in decentralized locations, as well as not putting additional strain on city grids and saving installation costs and efforts, although the question does remain how a solution such as this will fare in a busier area. In order to use the charging trailers, EV drivers can purchase an unlimited use subscription for $99 per year, or the trailers can be leased by fleet operators for on-site use. The trailers can charge both electric vehicles, as well as provide support for micro-mobility vehicles, such as electric scooters or e-bikes. For these, these capacity of the trailer is expected to fully charge about 400 e-bikes or scooters. 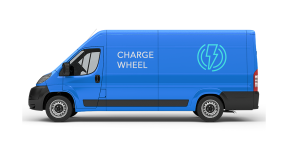 Good plan to assist EVs quickly wherever needed, HOWEVER, no mention as to whether the van which carries the battery pack and DC fast charge EVSEs is a BEV or an ICE.